American Combat Ju-Jitsu students during a sparring match. 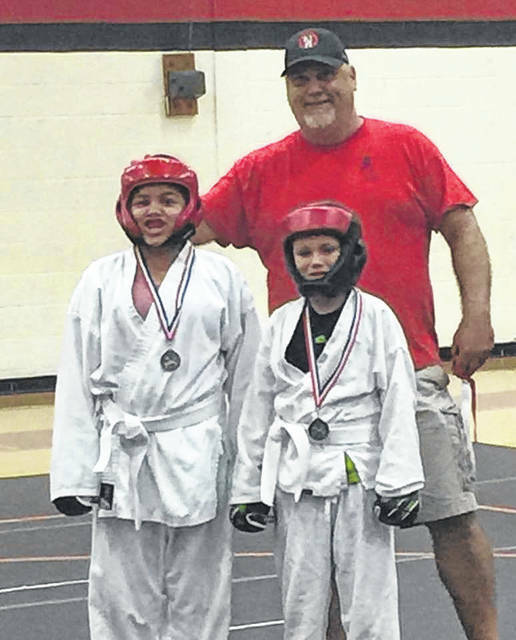 Chet Horton, American Combat Ju-Jitsu instructor for the East Park Martial Arts Club, pictured with two of his students. POINT PLEASANT — A Point Pleasant native is looking to bring a new style of martial arts to the area and offer free classes. 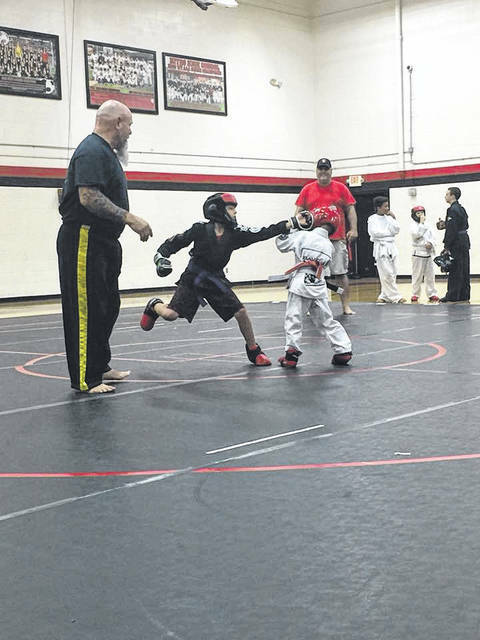 Chet Horton, American Combat Ju-Jitsu instructor for the East Park Martial Arts Club, has been teaching children and adults martial arts for nearly two years in Beckley. Though he will continue teaching his classes in Beckley, he would like to find a space to hold a four hour American Combat Ju-Jitsu class two Saturdays a month in Mason County. Horton hopes he can partner with a local business, so he can offer free classes to the children of Mason County just as he can in Beckley. All adults involved with the class will have background checks done and be drug tested. Each student that joins the class will be asked to sign a waiver in case of injury. Horton added though his first option of location is in Mason County, he would also hold his class in Gallia County, so long as Mason County children can still have access. In Beckley, his classes are held on Tuesday and Thursday evenings at the Southern West Virginia Multicultural Center located at 100 Washington Street. Children aged six-12 start class at 6 p.m., adults aged 13 and older start class at 7 p.m. Classes are free to the public. Also, Horton teaches a class two Mondays a month for local foster children at Burlington United Methodist Church in Beckley. According to the East Park Martial Arts Club Facebook page, students learn traditional martial arts as well as modern combativeness, blending them into a formidable self-defense and fighting system. Students learn techniques in class, apply them while sparring, and apply them under pressure during competition. Horton explained students begin as a white belt, then progress to yellow belt to orange belt to green belt to purple belt to three separate levels of brown belts, and then obtain their first degree black belt. Prior to obtaining his own space to teach, Horton was teaching as a senior student instructor for other American Combat Ju-Jitsu classes. Horton said while he was growing up in Mason County he always wanted to be involved in a martial arts class, yet his family did not have enough funds to support this wish. However, he did participate in many other sports while growing up. At his classes, Horton and his other instructors emphasize life skills such as accountability, setting and attaining goals, loyalty, courtesy, honor, courage, perseverance, integrity, and self-control to help give their students happy and successful life through the martial arts. Horton shared the students who take his class are the ones who need to obtain these aspects of their lives the most and he wants to offer the children of Mason County this same type of opportunity. For any businesses or organizations interested in hosting a four hour American Combat Ju-Jitsu class two Saturdays a month, can contact Horton at (304) 237-3063. Erin Perkins is a staff writer for Ohio Valley Publishing. Reach her at (304) 675-1333, extension 1992.